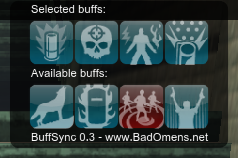 BuffSync from Bad Omens is a small HUD mod to display the group buffs, whether they are active or not, including the name of the characters who recently cast the respective buffs. Its goal is to assist with the timing and rotation of group buffs in groups and raids. It supports Viper's TopBar Information Overload, click the BS icon next to the compass to toggle the buffs window. Without VTIO BuffSync is shown only when you are grouped, do not panic when you don't see it upon login. To move the buffs bar right click any of the buff icons to unlock it, then you can move it around by grabbing its border. When unlocked you can left click the buffs to select/deselect them for tracking. Supported group abilities: Breaching Shot, Deadly Aim, Short Fuse, Pack Leader, Flak Jacket, Cleanup, Reap and Sew, Greater Good. Short Fuse is dimmed out more while its debuff is active. Support for selecting preferred buffs. Support for UI resolution scale.